Sweet and spicy, this savory barbecue sauce will deliver just the right amount of smoky flavor to your customers' food. These 12-gram packets are ideal for any restaurant, diner, convenience store, cafeteria, or take-out station and offer a quick and easy way to enhance profitable menu items. A brand you can trust to deliver premium sauces, Flavor Fresh fills each portion control barbeque sauce packet with wholesome ingredients and tangy spices. This sticky-sweet barbeque sauce is perfect for any grilled meat, and is also great for drenching fried foods such as chicken nuggets and tenders in a thick and flavorful sauce. Bursting with bold flavor, this tasty barbeque sauce is the perfect blend of flavorful spices, savory onions and garlic and sweet syrups. Beyond its use as a classic dipping sauce, this flavorful sauce is a delectable addition to chili, meatloaf and even crab cake filling. Whisk the perfect portion of barbeque sauce into vinaigrettes to add a southwestern touch, or spread it on sandwiches for a sweet and spicy kick. 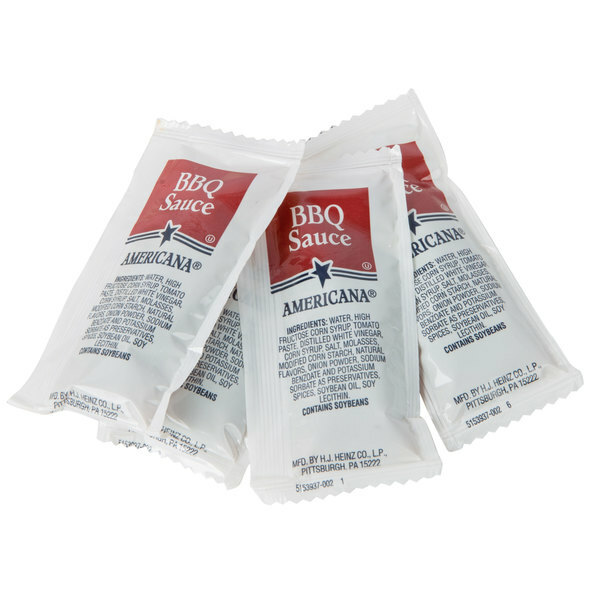 These portion control barbecue sauce packets make for a delicious and convenient addition to your menu. This is a great BBQ sauce. 12 grams is a really good portion size! The packaging is great and the packets are easy to tear open. This is a product that has made me second guess myself about purchasing bbq sauce in a packet. I have always purchased bbq in dipping cups for takeout but, the price was amazing and so were the reviews. I am glad I purchased this because it tastes a lot better than I expected and my customers enjoy it. I would purchase this again. Good freshness date, fast shipping. The sauce is good and thick with a dark color, not the vinegar taste but a midwest sweet, we will be ordering more. Thanks ! 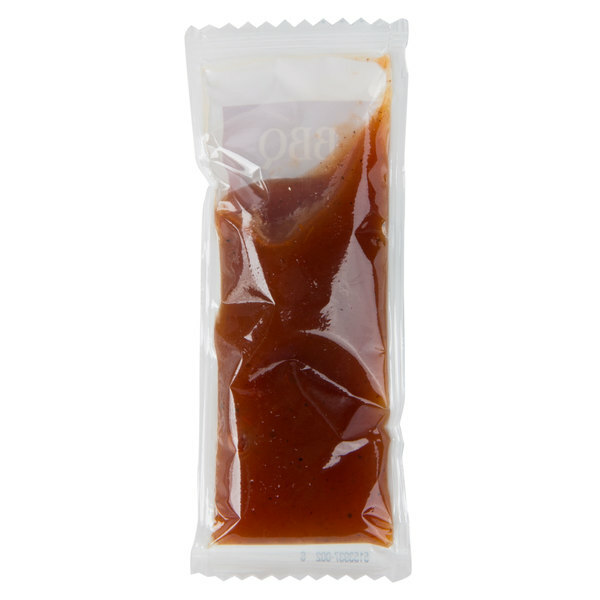 The barbecue sauce is excellent and the packets are great for us to use. The sauce has a top notch flavor and is perfect for our diner. 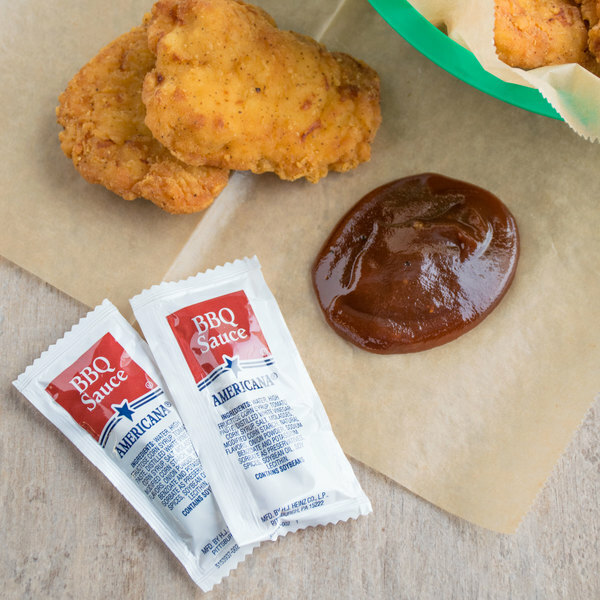 The barbecue sauce is packaged great in the smaller portion packets that makes it easy to serve our guests. A nice tasting sauce as well. A nice option for our bar and grill. The barbecue sauce is well packaged and has a great flavor. The sauce is a little zingy and the packets are easy to open. It's actually a decent tasting BBQ sauce for not being name brand. I was serving it at an outdoor event to mostly teens and I had no complaints. A nice, smoky flavored BBQ sauce in great portion packets. A great way to include sauce in our to go smoked chicken plates. You will love the great taste of this sauce. This is a great tasting and low cost BBQ sauce that will keep your customers happy. The packets are well made and easy to open. This sauce tastes awesome. It almost tastes better than homemade. I put these out very often and always have to replenish cause people love it. These are great portion packs of BBQ sauce in easy to open and squeeze packets. We really flavor is good and the price point excellent. Good flavor and fast shipping! Perfect for to go orders. Works perfect for our weekend outdoor BBQ events. Everyone loves this sauce. It is very well priced as well! Good flavor, great price, fast shipping means this items is on our rapid reorder list to keep our food truck and cafe stocked with take out sauces. This is a good BBQ sauce for the price. I normally us this on a bacon cheddar cheese burger. And it taste so freaking delicious. These are great because they are easy to hand out and carry with you to use whenever needed. They are decently proportioned. I though usually do use more than one. I enjoy the flavor. We like these small packets of BBQ sauce. Good for small orders that might not require a full 2-oz. souffle cup of sauce. The flavor is good, but not my personal favorite, as I like my sauce a bit sweeter (like honey). This was more "plain regular BBQ" flavor. Good flavor of sauce and perfect for a side. 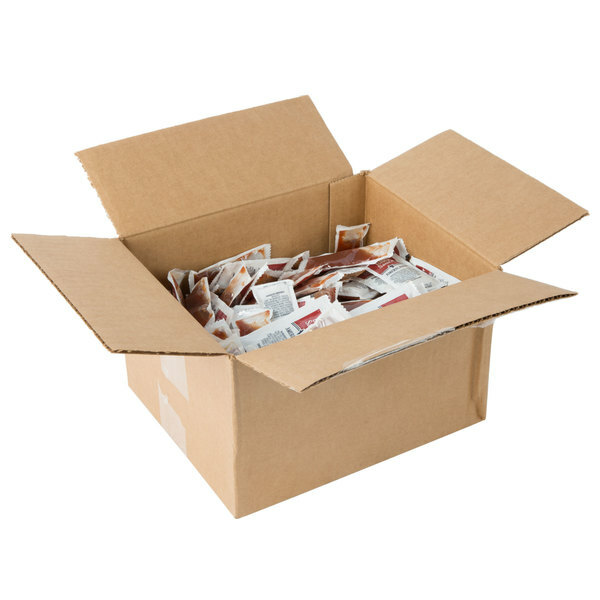 this package holds a lot of BBQ sauce and is perfect for the customer and on the go. 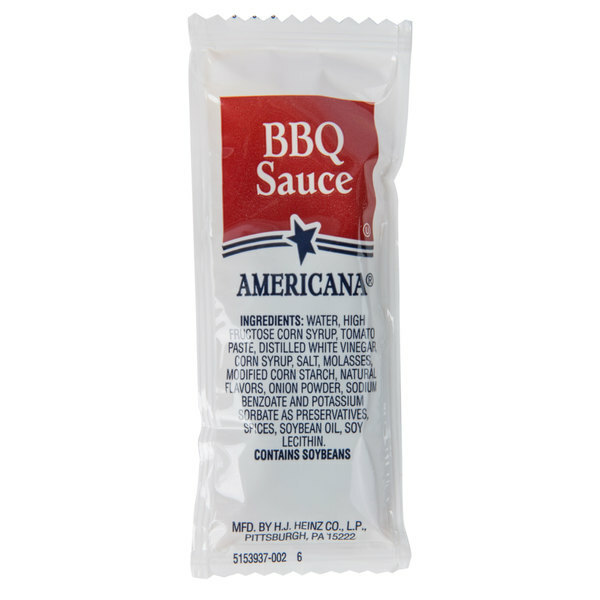 we use these alote on take outs, the barecue [bbq] sauce 12 gream pack is very easy to take where every you go thanks webstaurant. 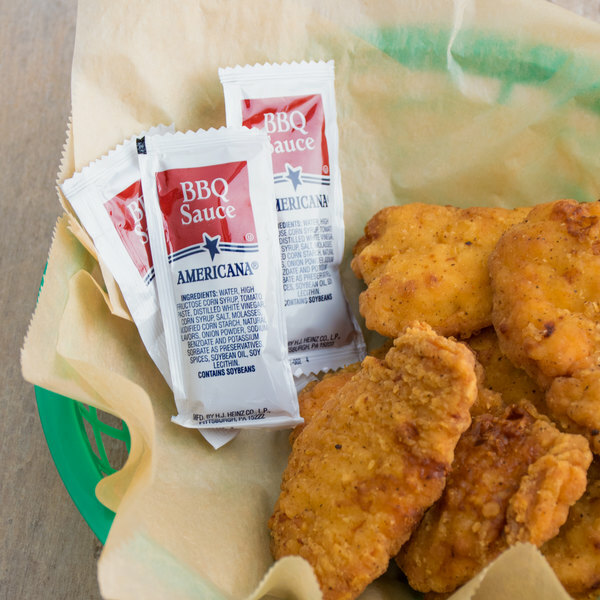 These packets are great for serving with chicken nuggets to go and kids meals! I like the size and the price of these!! They are perfect for drizzling BBQ on bacon wrapped hot dog bites!